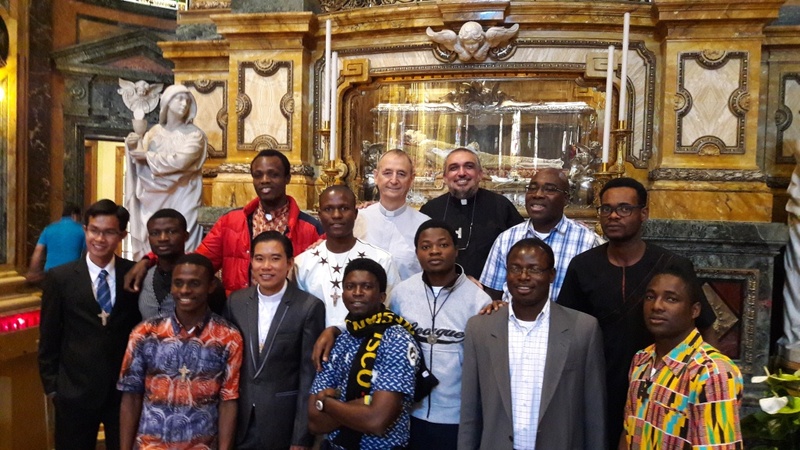 From Matadi Monrovia Community left for the "missio ad gentes" a young Salesian from Nigeria: Emmanuel Ilodigwe. Last 25th of September, I was present in the Basilica of Mary Help of Christians in Turin when, together with 47 missionaries (among Salesians, Daughters of Mary Help of Christians and lay people), he has received the mandate and the missionary cross. Emmanuel, in 2010, began his training journey as Salesian aspirant in Onitsha, the mission which the Adriatica Salesian Province started. It was the 31st January 1989, at the conclusion of the centenary celebrations year for the death of Don Bosco. You may ask why I am writing these information. in one of the stages of the updating course for Missionary Spirituality, we climbed the hill “Bricco del Pino”, near the birthplace of Don Bosco. There we read the fifth missionary dream that starts from that very spot. Don Bosco narrated that at the beginning he heard the shouting and then saw a huge amount of children who, running around him, were saying: "We've waited so long, but finally you are here: you are among us and will not escape from us!" . In the dream, Don Bosco was shown of many young people from America to Africa, to Asia, to China. When Don Bosco exclaimed: "But how to do all this work? The distances are immense, difficult places, the Salesians are few ... ! "He was told:" Do not fear, the work will be done by your children, your children's children, their children ... ". Being present at the event of the entrusting the Missionary Cross to the young Salesian Emmanuel, was for me a first-hand realization of the prophetic dream of Don Bosco.